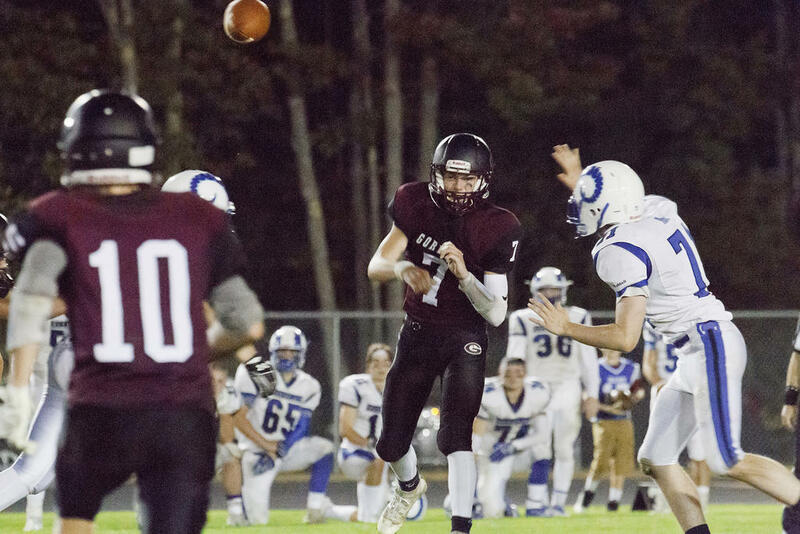 Gorham QB Jack Niles whips a pass leftward, intending to hit Austin Arsenault. GORHAM—No. 1 Kennebunk locked horns with No. 8 Gorham on Friday night, Sept. 22, ultimately battering them for eight TDs and a 54-8 final. Still, Gorham displayed ample prowess now and again, even getting the second-to-last laugh when they scored late in the third on a Tyler Rollins dash up the middle. Kennebunk controlled the bout throughout, and Gorham committed a number of errors – there’s no denying any of that. Kennebunkers Dante Delorenzo and Cam Lovejoy both carried one-yarder TDs across the goal line early in the first quarter, and Gorham QB Jack Niles threw a pick-six to Kennebunker Zack Sullivan shortly thereafter. Gorham kicker Ethan Roy toed a punt late in the stretch, setting up the opposition with good field position and allowing them to notch another six points (on a 22-yard pass, Tripp Bush to Bryan Hickey). But the 54-8 final doesn’t, perhaps, accurately reflect the state of the Gorham program – and it definitely doesn’t reflect their effort. The team flashed superb play at times; against an opponent as high-caliber as Kennebunk, that’s no mean feat. On Kennebunk’s first scoring drive, when Bush threw long for Sullivan, Gorhamite Noah Lambert was there, tattooed to Sullivan – delivering flawless coverage. Sure, Sullivan reeled in the 33-yard ball, but not because Lambert didn’t do his job. Likewise, on Kennebunk’s second scoring drive, Hickey managed to pull down a 14-yard Bush pass despite brilliant coverage by Gorhamite Ben Eichner. And then there was Adam McKenny’s astounding, successful effort to block Kennebunk’s fourth PAT attempt: McKenny didn’t slide through the middle or vault over his teammates, he zipped all the way around the end of the line and, diving, stuffed the Kennebunk kick. And Gorham’s lone touchdown followed on a well-executed series. Niles began it from Gorham’s 15 with 3:30 remaining in the third, hurling a sharp shot left for Rollins, who carried all the way out to the team’s 40. Rollins then juked up the middle for 13 more, powering Gorham into Kennebunk territory. Kennebunk pass-interfered on the following snap, handing Gorham another 15 yards, and Niles scampered up the middle for 16 on the snap after that. From there, Rollins rushed the remaining 16 for the last touchdown of the evening and Niles dropped a cherry on the drive, crashing the end zone for a two-point conversion. Gorham drops on the loss to 2-2. A .500 record is a sign of life for the Rams, who went 0-8 in 2016. They’ve picked up wins this year vs. Noble (35-7) and Medomak Valley (20-6). Moreover, they lost only narrowly to Mt. Ararat (14-13). Next up on their docket: Greely in week five. Kennebunk advances to 0-4. These Rams – arguably the favorites for this autumn’s Class B state crown – are undefeated, having dominated all comers, including No. 2 Falmouth (51-34). They host Brunswick on Thursday the 28th. Tyler Rollins scored Gorham’s lone TD vs. Kennebunk Friday night, on a drive that include this nimble run. Adam McKenny returns a kick for Gorham vs. Kennebunk. Gorham’s Ethan Stump lines up at Center. Ryan Reno (75) congratulates teammate Tyler Rollins on Rollins’s touchdown run.